Canvasback ducks measure 19 to 24 inches and weigh 3 to 5.6 pounds. Males have a dark reddish head and neck, grading to blackish on the face and crown. The mid-back is white with brownish black on the rump and upper tail coverts. The underparts are white with some black. Females have the same color head as males, but with more buff around the eyes and on the cheeks. Most of the upperparts are dark brown. The canvasback is primarily a fresh water pochard or diving duck and is not adept at walking on land. Its feet are farther back on the body and have large webs. The range of the canvasback duck is from Central Alaska to northern California, east to Minnesota, and they winter in southern California and the Pacific and Atlantic Coasts to southern Mexico. Canvasback ducks inhabit shallow prairie marshes. 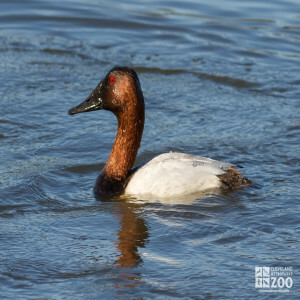 Canvasback ducks are seasonally monogamous. Courtship begins during the spring migration and continues on the breeding grounds. Males and females generally remain with a partner during the season, although occasionally males have extra pair copulations or abandon a first mate for a second. Females use courtship displays to assess male quality, especially male ability to compete for food and space. During the height of courtship, receptive females are periodically surrounded by 3 to 8 males in "courting parties." There are a variety of courtship displays: the neck-stretch, incite behavior, a male sneak approach, kinked-neck, head-throw, and turning the back of the head. All are used to start and enforce the pair bond.